After Tornadoes Hit In And Around New Orleans, Wall Of Storms Moves East : The Two-Way The National Weather Service says multiple tornadoes touched down in southern Louisiana on Tuesday, and severe weather moving east threatened other Southern states. A wall of dangerous storms is moving across the South, threatening communities in their path with high winds, severe thunderstorms and possible tornadoes. The National Weather Service warned of severe thunderstorms and hail along the Mississippi coast and issued a series of rapidly updated tornado warnings for parts of Louisiana and Mississippi. The NWS New Orleans Office is updating its Twitter account here with information for the U.S. Gulf Coast. The governor of Louisiana, John Bel Edwards, declared a state of emergency after severe storms moved through the southeastern part of the state. Earlier Tuesday, the National Weather Service confirmed that multiple tornadoes touched down in and around New Orleans. The website for the electricity utility in New Orleans, Etergy, showed that more than 15,000 customers had lost power. New Orleans Mayor Mitch Landrieu told The Associated Press that dozens of people reportedly suffered minor injuries, and a spokesman for the city's Emergency Medical Services described those injured as "walking wounded." 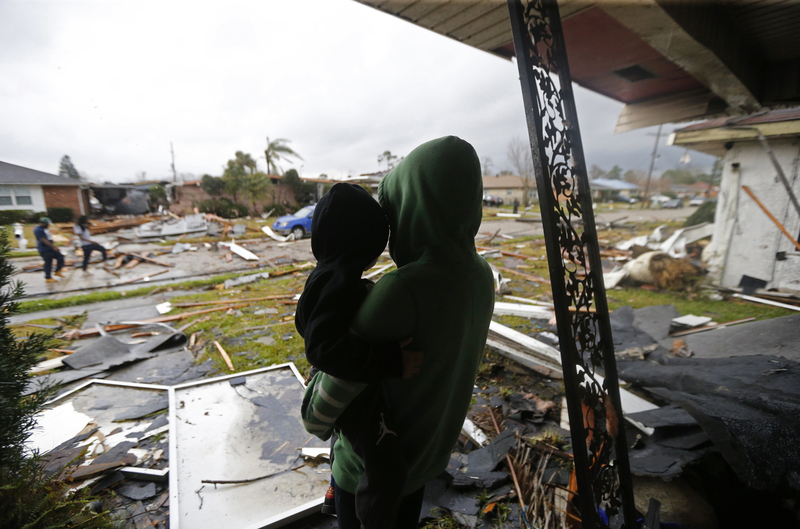 Eshon Trosclair holds her son Camron Chapital on Tuesday after a tornado tore through while they were inside their home in the eastern part of New Orleans. The National Weather Service says at least three confirmed tornadoes touched down, including one inside the New Orleans city limits. At 11:33 a.m. CT, the NWS office for New Orleans tweeted, "Dangerous tornado on the ground in New Orleans East. Take Shelter IMMEDIATELY!!!" Kimberly Chaney told the AP she was trying to record a video of the tornado when her mother pulled her inside their home. "Four of them huddled in a middle bedroom as the twister hit, knocking down part of the roof and blowing out the windows," the news service reported. "[Chaney] says their cars all were totaled, and her niece is worried because her computer was damaged with her homework stuck inside." "[Chaney] says she told her: 'It's a natural disaster. Your teacher will understand.' "
Images of the area published by the New Orleans Times-Picayune showed funnel clouds, hail and dark skies. A video taken in one neighborhood showed twisted metal and downed trees, emergency vehicles and power lines crisscrossing debris. The newspaper reported at least one injury in New Orleans East. Outside Baton Rouge, local ABC affiliate WBRZ reported that two mobile homes were "completely gone," posting photos to Twitter of twisted metal in a tree and a toothbrush standing upright in the grass. Homes were damaged in the city of Donaldsonville, between Baton Rouge and New Orleans, where photos shared on the official town Twitter account showed a home without a roof, and wood and metal in the road.